Learn about the consideration process that major donors and legacy supporters go through as they determine who they want to give to. Learn just how important letting donors opt-in is and the value of treating your donors how you’d like to be treated. Jason Lewis, the author of the War for Fundraising Talent, joins Greg and Tim to discuss the value of a thank you call, fundraising conferences, and much more. Learn more about MarketSmart at www.imarketsmart.com. Learn more about the Engagement Fundraising Book at www.engagementfundraisingbook.com. The War for Fundraising Talent: And How Small Shops Can Win is available on Amazon and wherever books are sold. Greg and Tim discuss the findings in this episode. Learn more about MarketSmart at www.imarketsmart.com. Learn more about the Engagement Fundraising Book at www.engagementfundraisingbook.com. Learn more about Dan at www.thefrontlinefundraiser.com. 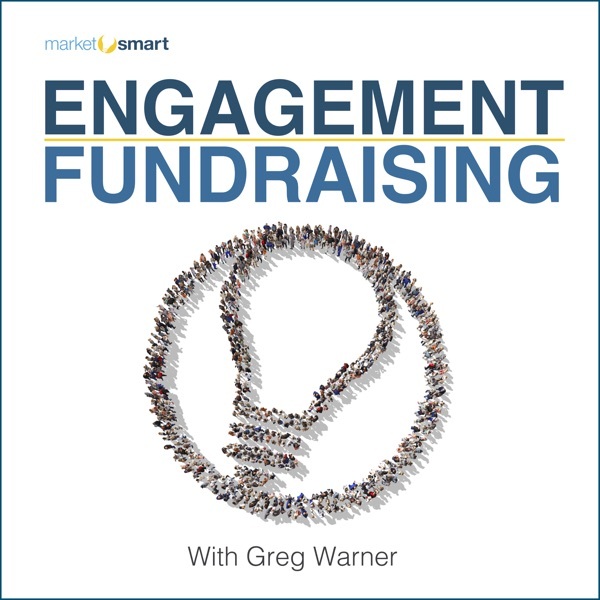 Learn who Greg Warner is and why you should listen to him in this retrospective episode of Engagement Fundraising. Greg interviews Erin Troia about her “Engagement Fundraising” experiences. Erin recently finished reading an advanced copy of Engagement Fundraising and tried out some of the concepts she read about in the book. Greg interviews Tim about his “Engagement Fundraising” experiences at MarketSmart. Learn more about MarketSmart at www.imarketsmart.com. Learn more about the Engagement Fundraising Book at www.engagementfundraisingbook.com. Learn what everyone is missing about the 410 billion dollars in giving as reported by Giving USA’s 2018 annual report. Learn more about MarketSmart at www.imarketsmart.com. The day of reckoning is coming for nonprofits all across the world. Will your organization be ready? Learn what is coming and how to be ready. Kelley McGeehan is Principal Consultant and Owner of McGeehan Research. She is a prospect researcher and in this episode we get a chance to explore why prospect research is valuable, the consideration continuum, why some organizations fail even with the right data at the right time and much more. You can find Kelley at www.McGeehanResearch.com. You can also listen to episode 15 of the How I Built My Fundraising Consultancy podcast for a different discussion that dives into how she built her business as well as some more prospect research topics. Learn more about MarketSmart at www.imarketsmart.com. Mark Santiago from Converge.Digital shares how to use Facebook strategically to build trust and acquire new donors. Learn more about MarketSmart at www.imarketsmart.com. For more info about how Converge helps Nonprofits get more donors, visit: www.Converge.Digital. Joining Engagement Fundraising is Andrew Olsen, senior vice president of Newport One. If you are a fundraiser trying to find that silver bullet then this episode is for you. Andrew will be diving into why there are no silver bullets and unicorns and instead why it takes a lot of little things to make a big impact. Learn more about MarketSmart at www.imarketsmart.com. We are joined again by special guest, Jim Langley, president of Langley Innovations. Make sure to listen to the last episode to hear the first part of this conversation. Educational institutes adapting to donor needs and being fair to your donors are the main topics discussed. Learn more about MarketSmart at www.imarketsmart.com and Jim Langley at www.langleyinnovations.com. We are joined by a very special guest, Jim Langley, president of Langley Innovations. Learn from the expert on taking a top down approach, working with board members, maintaining and building trust with your donors, and much more. This is just the first part of the conversation, stay tuned for the next episode for the rest! Learn more about MarketSmart at www.imarketsmart.com. Learn more about Jim Langley at langleyinnovations.com. We are joined by Jen Willett to discuss what it’s like to be a donor. Hear stories from our experiences donating to various nonprofits. Learn more about MarketSmart at www.imarketsmart.com. Season 2 of the podcast kicks off with a special episode featuring Jeff Giannotto and Lizzie Weiland. This season is all about engagement fundraising in action. Learn about the power of surveys and hear some success stories about organizations that have implemented engagement fundraising. Learn more about MarketSmart at www.imarketsmart.com. On today’s episode we talk about phone calls; who should be answering your phone, how best to initiate a conversation and much more. Learn more about MarketSmart by visiting www.imarketsmart.com. On today’s episode we discuss how fundraisers can utilize LinkedIn. Learn more about MarketSmart at www.imarketsmart.com. On today’s episode we discuss creating the Disney experience for your donors. Visit www.imarketsmart.com for more information about MarketSmart. What’s Next for Engagement Fundraising? A quick announcement about what’s next for the Engagement Fundraising Podcast. Learn more about MarketSmart at www.imarketsmart.com. On today’s episode we continue discussing creating a strong fundraising caseload. Learn more about MarketSmart at www.imarketsmart.com. On today’s episode we discuss creating a strong fundraising caseload. As you’ll hear, we dive pretty deep into this topic, so this discussion is split into 2 episodes. Stay tuned next week for the conclusion to this discussion. Learn more about MarketSmart at www.imarketsmart.com. On today’s episode we discuss fundraising consultants and why you as a fundraiser should consider hiring one. Learn more about MarketSmart by visiting www.imarketsmart.com. On today’s episode we discuss our second set of listener submitted questions. This time on if the approach to public and private school fundraising is different and how to determine what fundraising marketing channels to focus on. You can have your question discussed on the show by emailing me - tim@imarketsmart.com. Visit www.imarketsmart.com for more information about MarketSmart. On today’s episode we discuss the 2017 Major Gifts Fundraising Benchmark Study. This study is the first of its kind by focusing on major gifts. You can download the report at www.iMarketSmart.com/2017BenchmarkStudy. On today’s episode we discuss donor advised funds. What they are and how your organization can take advantage of them. Learn more at www.imarketsmart.com. On today’s episode we discuss our first user submitted question on cultivating relationships with donors and why it’s so hard to change the mindset at an organization that’s always done something a certain way. You can have your question discussed on the show by emailing -tim@imarketsmart.com. Learn why people give in this episode of Engagement Fundraising. Visit www.imarketsmart.com for more information. Learn the six expectations donors have of non-profits. Learn more about MarketSmart at www.imarketsmart.com. Learn about the four selfs of Engagement Fundraising. Learn more about MarketSmart at www.imarketsmart.com. Learn how to use email in a way donors love, how to use it to track engagement, some pitfalls to avoid, and much more. Visit iMarketSmart.com to learn more about MarketSmart. Learn about the 7 core principles that make up engagement fundraising. Learn more at www.imarketsmart.com.